Michelle Darnell (Melissa McCarthy) is a self-made businesswoman and financial icon. She is arrested for insider trading, leading her accounts and property to be seized by the government. After getting out of jail, she seeks help from her former assistant Claire (Kristen Bell). Claire is a single mom with not much space, but reluctantly allows Michelle to stay at her place with her and her daughter Rachel (Ella Anderson) until she can get back on her feet. Inadvertently, Claire and her daughter inspire a new idea Michelle thinks will help her rebuild her fallen empire. Melissa McCarthy has made movies that were hit or miss for us. Her last film was "Spy," which we really, really liked. Unfortunately, the last time she and her writer/director husband Ben Falcone teamed up to make a movie, they gave us the meh-worthy "Tammy." We were not fans of that film, so knowing their track record certainly made us a little apprehensive going into "The Boss." With lowish expectations, we forged on, and this time around, we are pleased to say we actually enjoyed this offering...for the most part. We laughed waaaaay more than we thought we would in its 99 minute run time, as did everyone in our screening. There were a couple dozen people watching the film alongside us and most of the audience laughed quite loud through the majority of it, which is something that doesn't happen all that often in our area. To our shock and surprise, some in the audience even clapped their hands in absolute elation during some portions! 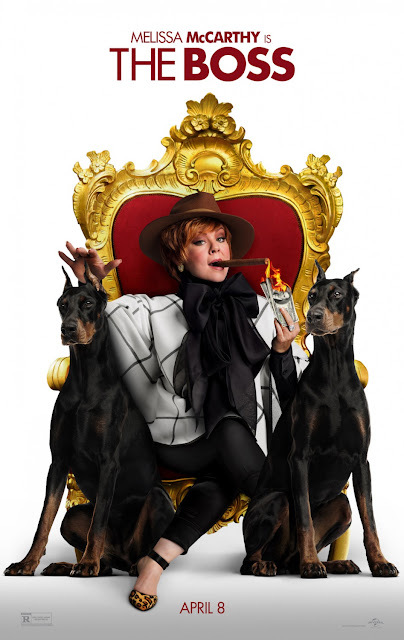 Whether they were just Melissa McCarthy fans or something else entirely, it doesn't change that "The Boss" does have a lot to offer if you've ever been a fan of her comedies in the past. As to be expected, there is a lot of crude, brash humor in the movie. From early on, Melissa McCarthy offers a slew of vulgar insults directed towards one character or another, though unlike the characters in her past films, somehow we believe with a character like Michelle Darnell, an oblivious, rich self-starter, she would act the way she does here. In the context of this film, it seems to work where it sometimes hasn't in the past, and we appreciate this time change. McCarthy also gets in her fair share of slapstick and visual gags as she and others are thrown from and off various objects. Most of these moments miss their intended mark, but a few land where they need to to be effective. Alongside McCarthy is Kristen Bell, who plays Claire, Michelle's former assistant and a single mom. Bell acts as the straight-woman for McCarthy's chicanery, and in doing so is able to garner a few laughs of her own as she is in constant conflict with her more blunt, sometimes abrasive former boss. Peter Dinklage plays Renault, Michelle's former lover who is obsessed with ancient Japanese culture and wields an impressive sword...and no, not that kind of sword. Look folks, we love us some Peter Dinklage, but his choice of comedy roles between this and "Pixels" has really left us scratching our heads. Dinklage's Renault is so over-the-top, he even tops Melissa McCarthy's level of over-the-top cartoonish villainy. Diggity-Dink, you need to start picking parts that suit you better than the one you played here. His character was just a miss for us. Of course, as with most Falcone and McCarthy/Solo McCarthy/raunchy comedies, the story is formulaic at best. There is a sappy subplot shoehorned in there about how Michelle has an internal conflict over the idea of familial bonds, as well as not knowing how to give and receive love to and from others. While we were usually to busy laughing to focus on any of these more glaring flaws, they certainly need to be addressed by us because we feel like we've seen this subplot before in other McCarthy romps. 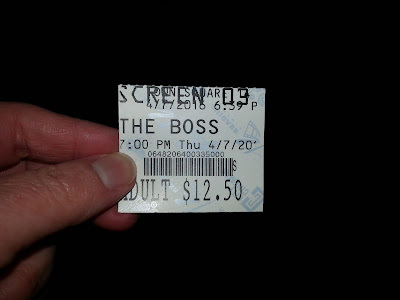 Most of "The Boss" is just fine, and we didn't leave the theater hating ourselves like we did after watching "The Heat." There are some great, hilarious scenes mixed in with a ton of risque humor, including a "Battle Royal" against two opposing groups of girls in a war over territory for baked goods sales. Girls clothesline each other and cut each others braids in a turf melee that we wish would have been kept out of the trailer. There is a lot more good than bad here, though some slight changes or revisions to its script could have been made to fine tune it into a better comedy. 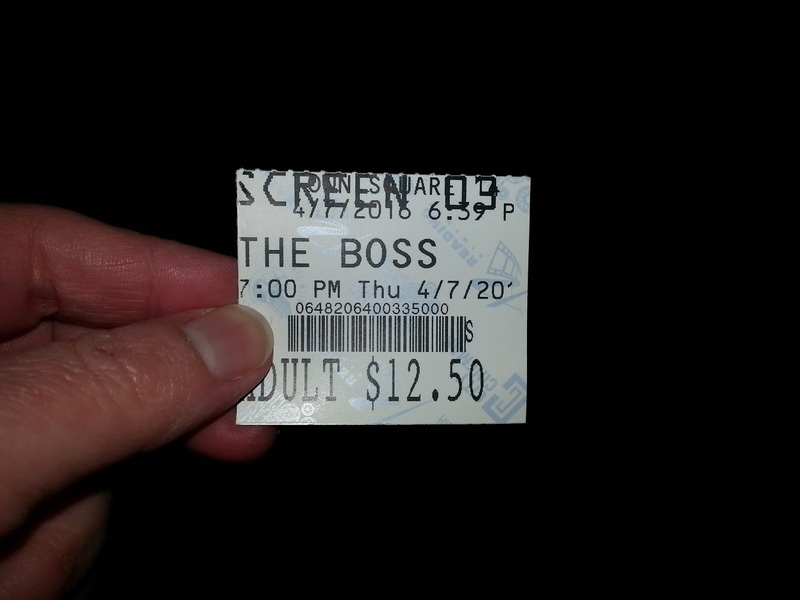 We are pleasantly surprised we enjoyed "The Boss" as much as we did. McCarthy might be getting tiresome for some people, but she's at the top of her game and as funny and fierce as ever...and boy, can she deliver a line! One year ago, we were watching: "The Lost World: Jurassic Park"